BRIGHAM CITY – It was a victory, a convincing victory, but came at a high cost. 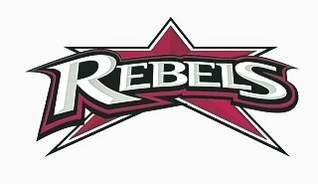 The Dixie Rebels traveled to Brigham City to take on the Brigham Sting and came away with a hard-fought 31-3 victory to advance to the Rocky Mountain Football League Championship game. They will take on the Wasatch Revolution, which held off the Utah Stealth to win their semifinal in an earlier game 20-17. But the Rebels will do so without league rushing leader and MVP contender Misi Tupe. Tupe was ejected in the third quarter for an alleged punch thrown at a Sting defender. In a quirky game for the Rebel offense, Dixie’s two rushing touchdowns were scored by receivers. Tanner Wood scored first on a 10-yard reverse to put the Rebels in front 7-0. After an Eric Brooksby field goal at the beginning of the second quarter, Wood tacked on another touchdown, this time through the air as he hauled in Tupe’s pass from 39 yards out. Tupe then connected with Brennan Adams for a 52-yard bomb just before the break, giving the Rebels a healthy 24-0 cushion. The second rushing touchdown was a one-yard plunge by tight end Jordan Loo. Those points would be the Rebels last coming with 10:25 to go in the third quarter. Shortly after the last touchdown, Tupe was ejected. From that point both teams coughed up the ball either on turnovers or on downs until the Sting scored a meaningless field goal with just under two minutes to play in the game. The Sting defense had been stingy all year, holding teams to 10 points per game. The Polynesian trio of Tupe, Rimo Mapu and Sione Tapuosi was in full throttle, carrying the ball 28 times for 214 yards. Tupe added 286 yards and two touchdowns passing to his totals, finding five different receivers. Similarly, the Sting offense had been averaging 25 points and 250 yards per game. The Rebels defense held them to 148 yards and only three points on a late field goal against Dixie’s backups. “I know that we frustrated them both offensively and defensively,” said Stott. Stott plans on appealing the ejection and ruling to hold Tupe out of the championship game. A team player wouldn’t have reacted like that when you are 31 points ahead!! Don’t compare him to Peyton Manning. Manning has so much more class and he cares about the team as a whole and what they do as a team. Anyone one can build their stats when they throw interceptons and run the ball themselves. You need to recognize that you have a successful team with or with out Tupe. It takes more then one person to make a team. I think if you knew the player you would realize he has a lot of class. And I don’t believe he was comparing the two players, but the two situations. But if he threw a punch–I think the league should let the ejection stand. Surely there is game film that will show who did what.